Over the next three months, I'll be attending three different conferences in three different cities. Part of planning for these events is getting the right attire together. Because as you know, one of the perks of working from home is being able to dress casually, so, getting the right outfits together definitely takes some planning. 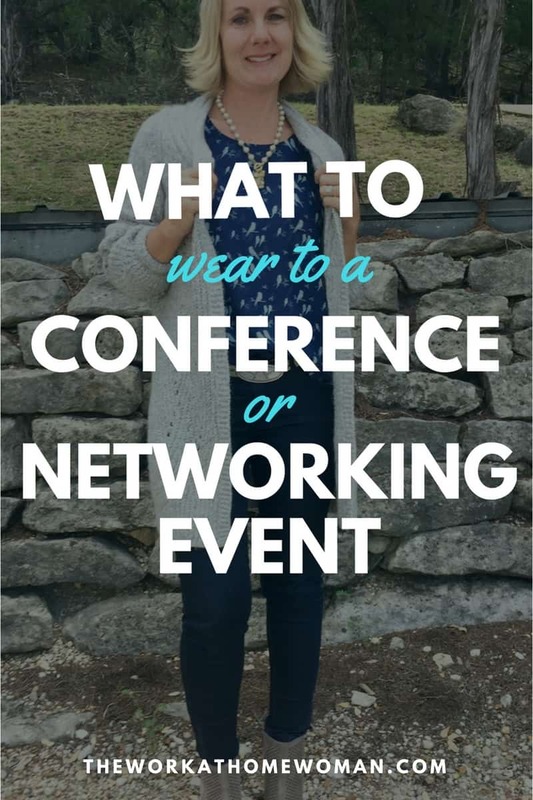 If you have a professional event in your future, and you're not sure what to wear, here's how I decide what to wear to a conference. What's the Dress Code for the Conference? You can assume for the majority of conferences and events the dress code is going to be business casual. While the term business casual leaves a lot of room for interpretation, there are some hard and fast rules for what not to wear: tennis shoes, shorts, t-shirts, tank tops, workout clothes, yoga pants, flip-flops, or ripped or torn denim. So what should you wear to a conference? Tops: Professional looking blouses, blazers, jackets, cardigans, sweaters, and camis. Be sure your clothing is clean and free of wrinkles; you should also stay away from tops that are too low cut and too sheer. Pants: Professional looking pants, denim, skirts, and dresses. Again items should be clean and pressed. If you're going to wear denim make sure it's a darker wash; refrain from trendy washes, cuts, and distressing. With your skirts and dresses, make sure the length is appropriate; below the knee and slightly above the knee tend to be more sophisticated, but long skirts and dresses can be worn too. Shoes + Accessories: Professional looking heels, ballet flats, loafers, wedges, mules, sandals, booties, and boots are all appropriate. Your shoes and accessories are what tie your outfit together, so don't overlook these items. A nice statement necklace and a handbag, purse, or a clutch can really dress an outfit up. Now, how to decide what to wear to your particular event. When I'm thinking about my outfits for an event, I like to consider what my role is at the event. If I'm an attendee, I tend to dress a little more casual. If I'm speaking or leading a roundtable discussion, I like to dress up, as it helps me to have a leadership mindset. Now, if you're attending a conference or an event and you plan on meeting potential clients, employers, or collaborators you should dress to impress. You only get one chance to make a first impression, so be sure you're dressed the way you want to be perceived. Another thing to consider is your comfort. Many conferences are multi-day events that require a good amount of walking. Wearing flats can save your feet from unnecessary pain, discomfort, and blisters. If you feel heels make your outfit, then wear them during sessions, and keep a pair of flats in your handbag for longer periods of walking. You also need to consider your internal temperature gauge. If you tend to be cold natured, be sure to bring a blazer, jacket, or a sweater. Most conference halls are kept at cooler temperatures to accommodate the large crowds. The last thing to consider is the niche of the event. Certain industries like blogging, direct sales, and social media conferences tend to be more casual, whereas business and career conferences tend to be more formal. When in doubt check the event's website for appropriate dress code, if a dress code isn't listed you can view photos of past events to get a feel for what attendees wore to past events. One thing you don't want to do is pretend to be someone you're not. Your attire should be event appropriate, but, it should also reflect your true personality and style, as this will help you to feel more confident. If you're not comfortable wearing dresses and skirts, don't. Wearing a nice pair of tailored pants and a blouse will work. Whatever you do, don't wait until the last minute to decide what to wear. I've made this mistake before and was left running around the mall at the last minute looking for something to wear. Not only did I end up purchasing something I didn't LOVE, but I also ended up only wearing the item once which is a total waste of money. Real Life Examples of What I Wore. This past weekend, I attended a blogging conference; and like I said above they tend to be more informal. I wasn't a speaker at the event, but, I did lead a tribe and do some one-on-one coaching so I wanted to look polished and put together. 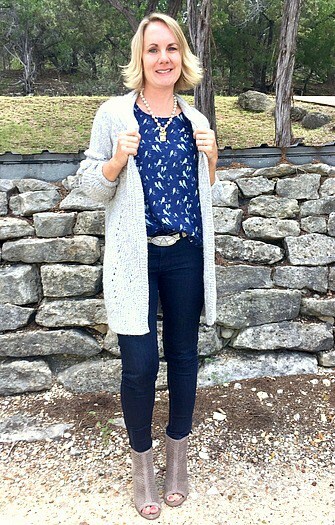 Each day I wore a combo of jeans, blouses, sweaters, and blazers. On the first day of the conference, I wore some dark skinny jeans that I got from Stitch Fix, this sweet little Astral Blouse from cabi, the Short and Sweet Pullover which is from cabi's limited Penny Lane Lovely Collection, and these adorable Carnaby Loafers (which I got a lot of compliments on). On day two of the event, I wore these dark High Straight Jeans , the Chirp Top, the Cathedral Cardigan which is also from cabi's limited Penny Lane Lovely Collection, the Heritage Necklace, and some booties from Lucky Brand. As you can see, you don't have to wear a pantsuit to look polished and professional. With a little thought and some planning ahead of time, you can look stylish and professional at your next conference or event. 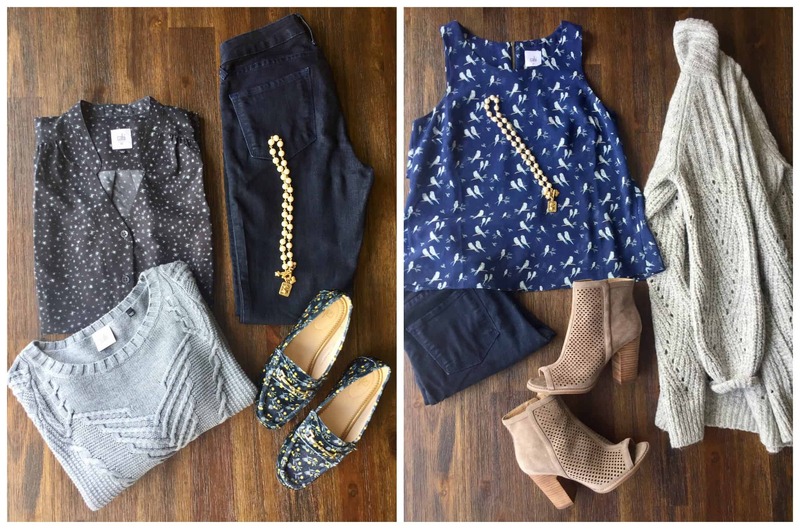 If you're interested in any of the pieces I mentioned, you can connect with a cabi consultant, but remember, the Penny Lane Lovely Collection is limited so you need to act quick before they sell out. What tips do you have when it comes to dressing for professional conferences and events? We would love to hear from you! Clothing courtesy of cabi. The Work at Home Woman was not paid for this post. This page includes affiliate links. Please be aware we only promote companies we feel we can legitimately recommend to our readers. Please see our disclosure policy for further information. I would have never imagined wearing something casual for a conference as a guy, but I guess times are changing. When it comes to business or conference dress code is very important. Thanks for sharing such wonderful article. Nice work. Keep updating! I look forward to read more. Glad you enjoyed the tips, Jennifer! It’s interesting to learn that business casual is normal for a business conference when it comes to a woman’s dress code. My wife is having a big one in January, so she’s panicking recently. It might have something to do with her promotion. In any case, I would love to buy her some clothes to help her have a smile even for a bit. I’ll try out your guide and have a look around some shops. Hopefully, she’ll like the style that I would get her. Thanks for the amusing read on what women have to wear for a conference! Glad you enjoyed the tips, Jeremy! Good luck to your wife!